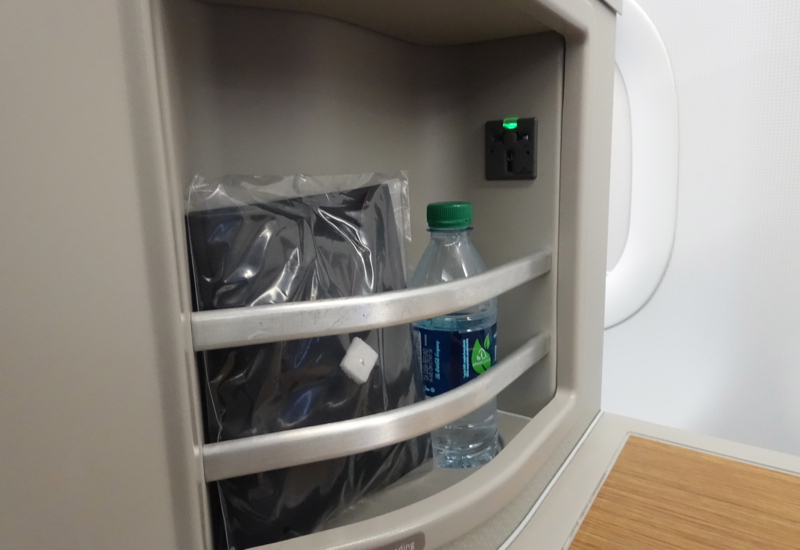 This American Airlines A321 First Class Review is one of several American Airlines transcontinental first class and business class reviews. 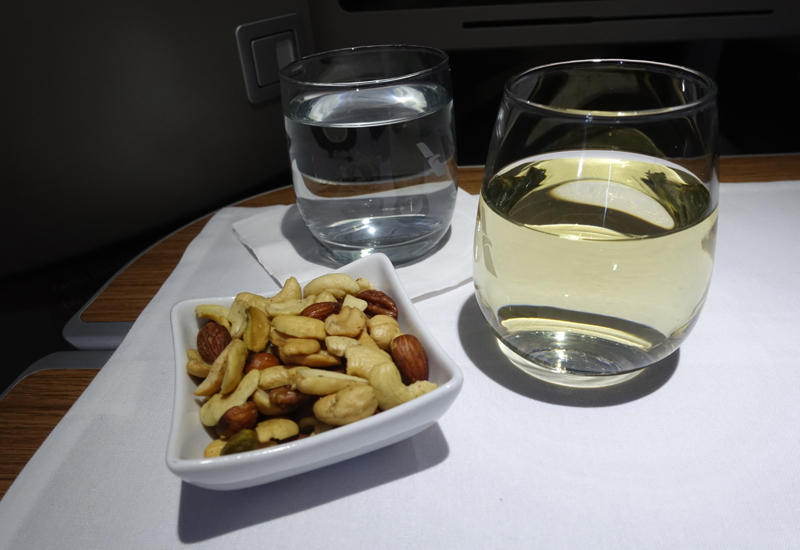 If you're wondering about the differences with Business Class, see our Review of American Airlines A321 Business Class New York to Los Angeles. 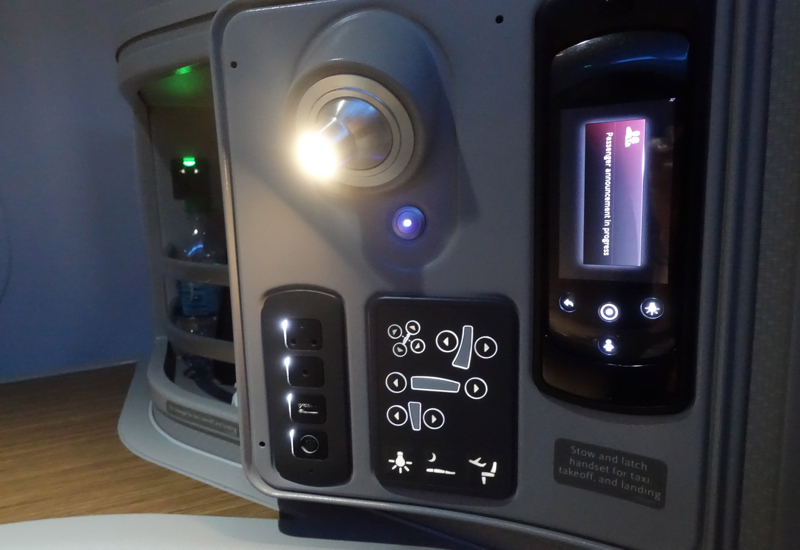 There are 10 first class seats in 5 rows in a 1-1 configuration on American Airlines transcontinental A321 aircraft, which makes it the only domestic U.S. premium cabin where all seats have direct aisle access (since on JetBlue Mint, there are only 4 suites; the other business class seats are in a 2-2 configuration, similar to American A321 business class). 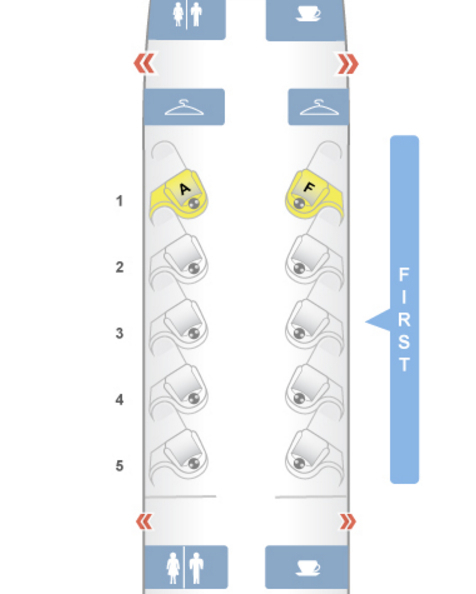 As always, I recommend avoiding the first and last rows, and instead selecting seats in rows 2 or 3 if available, so you have the convenience of being closer to the front when deplaning, but also aren't potentially bothered by light or noise from the galley and lavatory, especially on late night flights or any flight where you're trying to sleep. The First Class seats angle away from the aisle and toward the windows. The seats are quite well padded and comfortable enough upright, and at 21 inches across, do provide more width than business class, which is about 19 inches. There's some convenient storage space on one side, and that's where I stashed my sneakers. American doesn't provide slippers, but I'd brought a pair from the Loews Regency San Francisco which came in handy as my plane slippers. 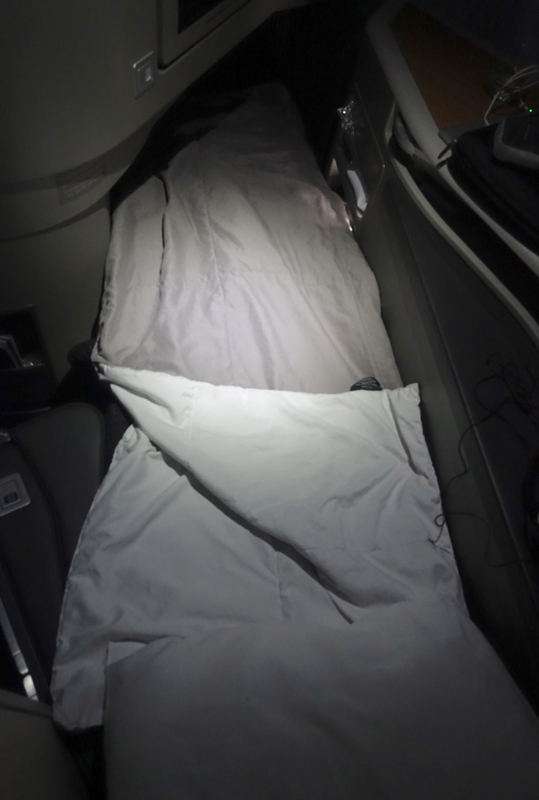 A plastic wrapped amenity kit and bottled water were easily accessible in a side storage compartment. Seat controls are prominent and intuitive, and adjacent to them are the audio jacks and USB port. After being welcomed onboard, we were offered a pre-flight drink. 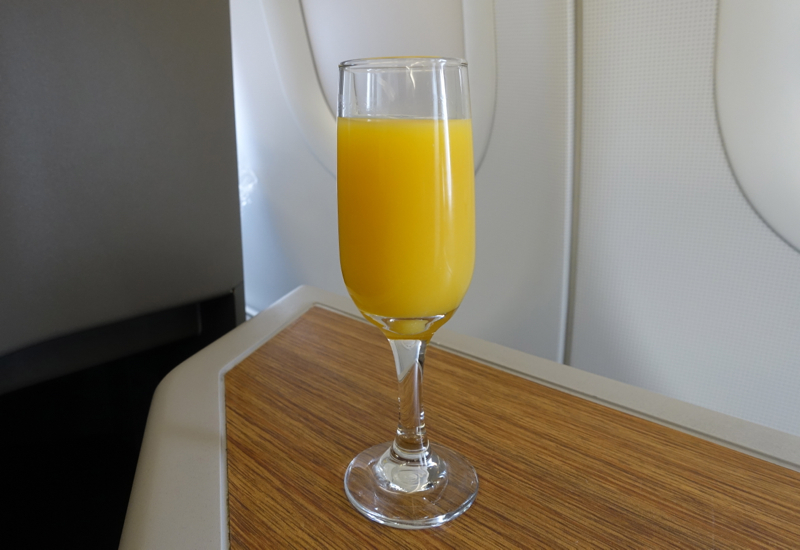 Both my son and I chose orange juice, which was fine, although not fresh squeezed as in Air New Zealand Premium Economy. 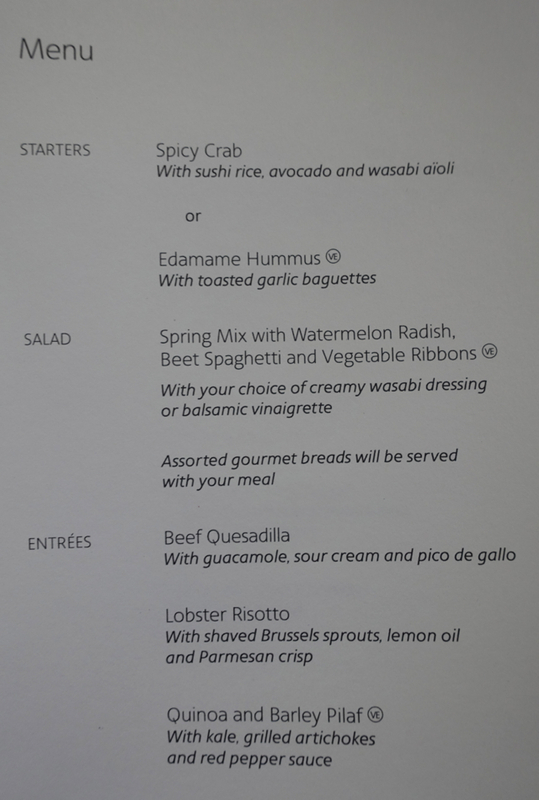 We were also provided menus, although it was interesting to me to see completely different selections to what I'd seen on the pre-order menu. 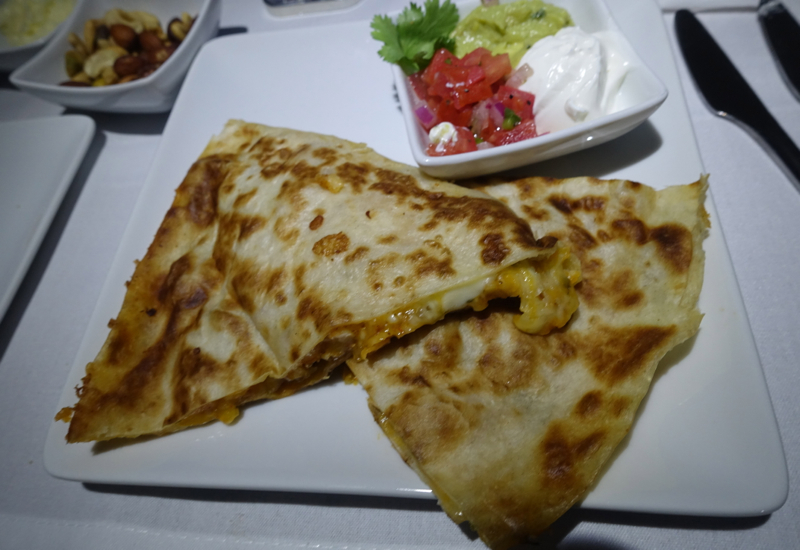 You can pre-order your meal selection 30 days in advance until 24 hours prior to your departure, and I did so, selecting a Thai red curry for me and a cheese quesadilla for my son. 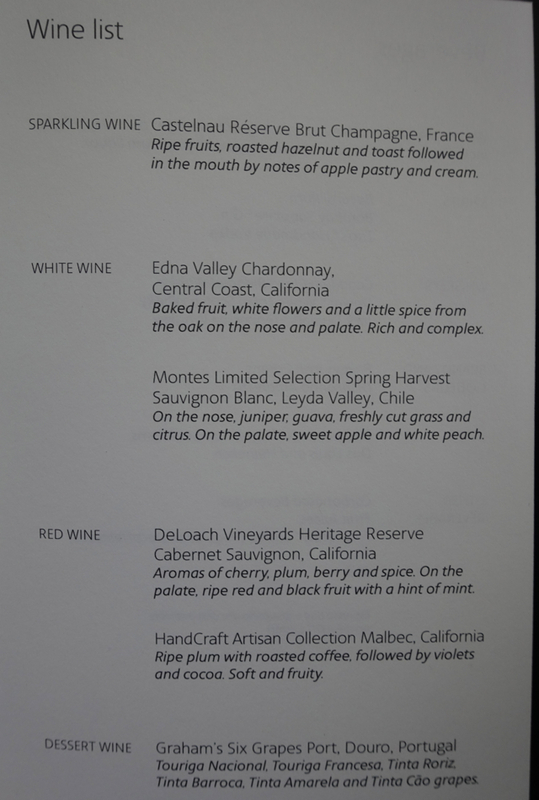 The menu we were given sounded great, and the head flight attendant actually went so far as to take our and other passengers' meal selections, before realizing that the menu didn't actually match the meals that had been catered for the flight. She came around to apologize and to provide the actual menu choices orally. 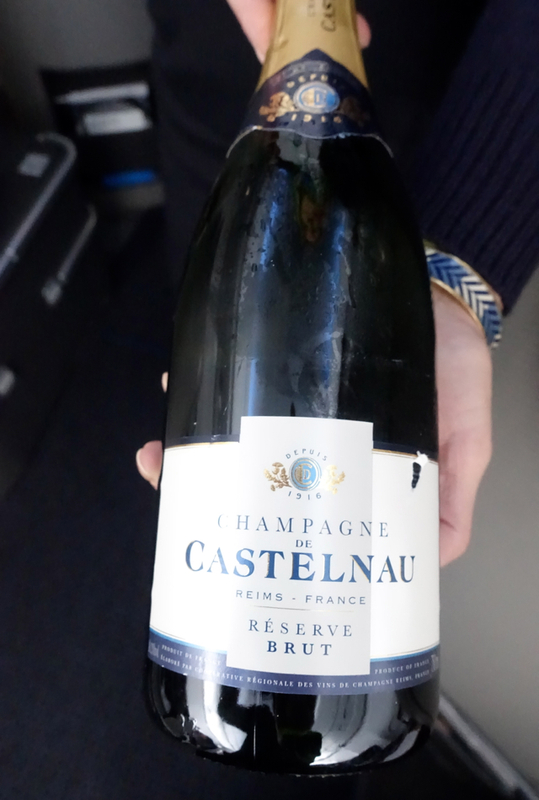 I'm not a big champagne drinker, but decided nonetheless to starte off with a taste of the Castelnau Reserve Brut Champagne, which was refreshing and about the quality I would expect on an AA flight. The Castelnau tends to retail for about $30 a bottle. Mixed nuts were served, but to my memory they were room temperature, not warm. I accompanied them with some of the Montes Sauvignon Blanc from Chile, which I also drank during the meal since there wasn't any Gewurztraminer on offer, which is what I usually pair with Thai food as a non-beer drinker. 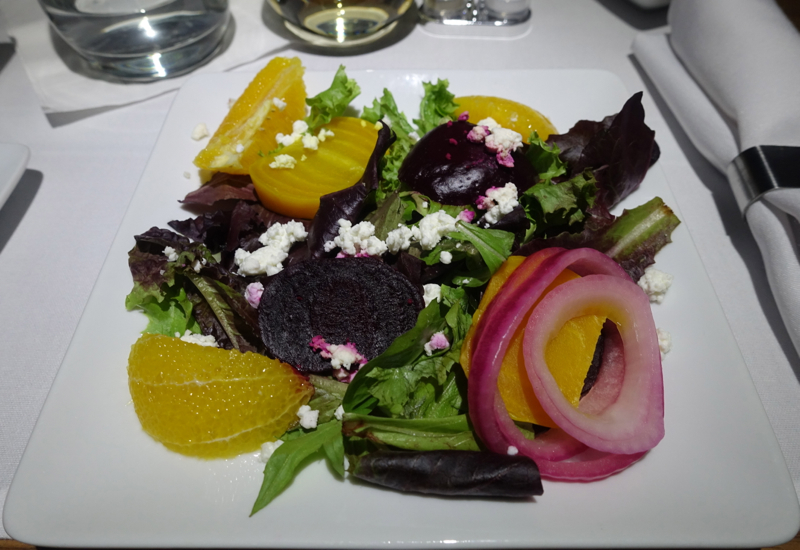 I really enjoyed my beet and goat cheese salad, which was very fresh–no wilted greens–and enlivened with some orange segments as well. 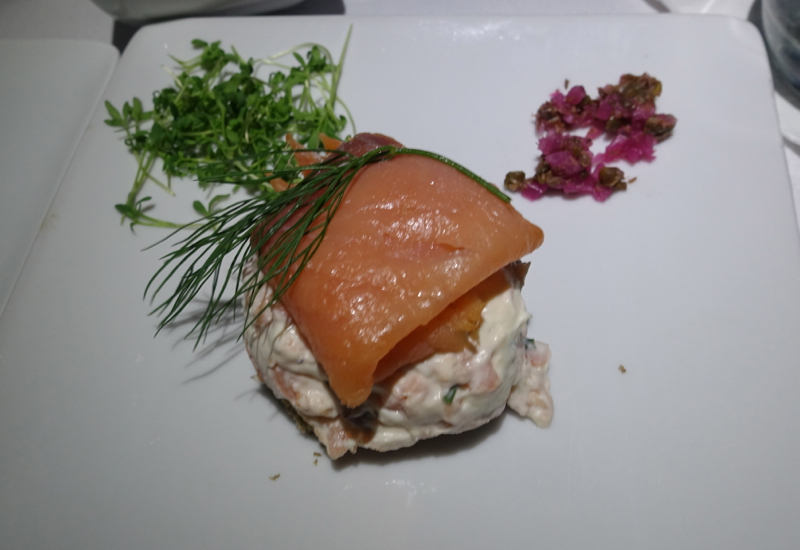 Meanwhile, my son loved his smoked salmon appetizer, and managed to mainly fill up on it. That turned out to be fine, since his main course of quesadilla was pretty average. The accompanying pico de gallo salsa and guacamole were good (although insufficient for the amount of quesadilla) but we make better quesadillas at home. 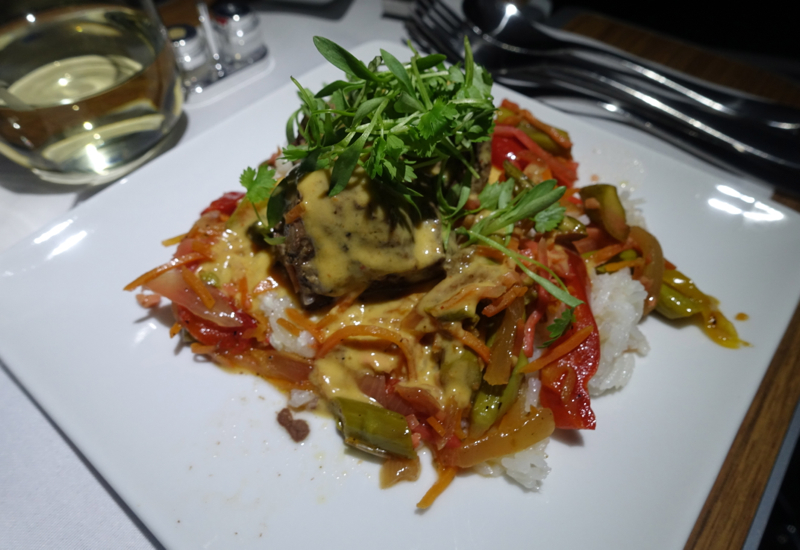 I liked but didn't love the Thai red curry with beef. You can't really expect great Thai food on an airline (even Thai Airlines' Thai curry in Thai First Class was quite average) but I appreciate the effort to provide something a little less bland than the usual fare. 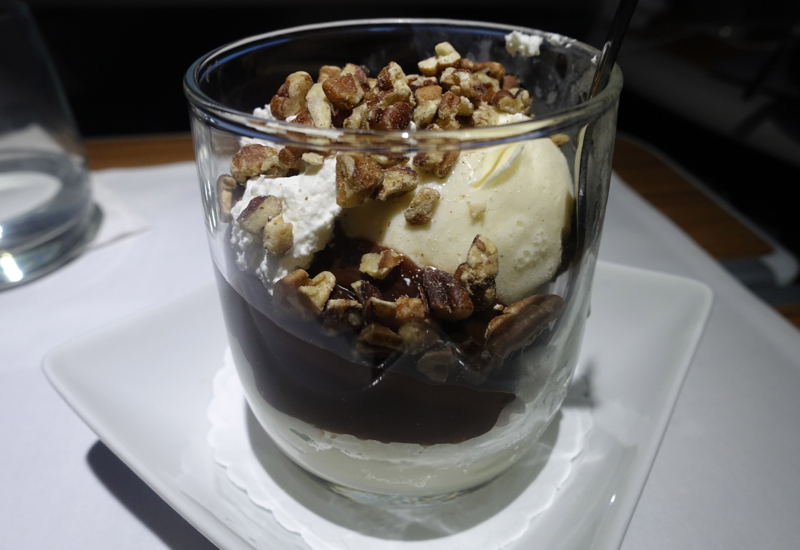 Dessert is always the hot fudge sundae, and while squarely comfort food, I wasn't complaining. The times airlines have tried to push culinary boundaries with cutting edge desserts have always failed, in my experience. 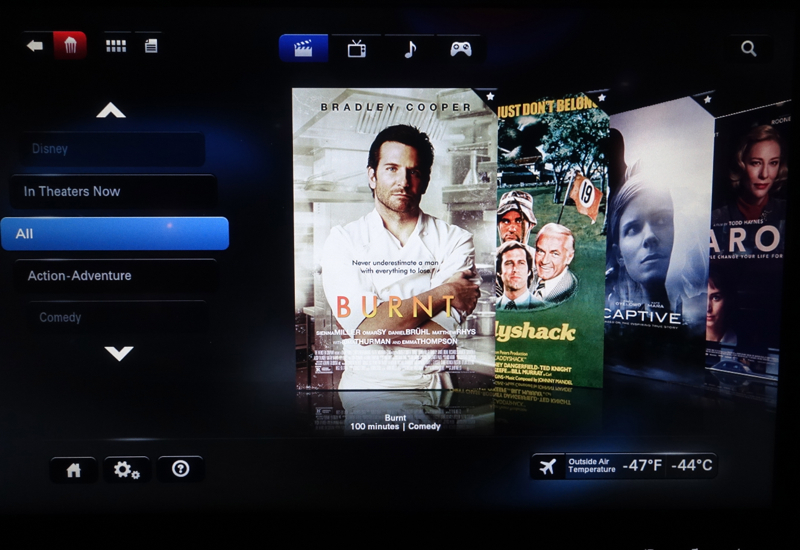 I only sporadically use the IFE, but appreciated the film selection on the American A321. I enjoyed watching Burnt, with Bradley Cooper and Sienna Miller, and also watched a bit of The Danish Girl, with Eddie Redmayne. Unlike last time, my headset audio jack worked fine. The only thing I don't care for is that the headphones are collected about a half hour prior to landing, so you have to switch to your own at that point. I'd thought it was odd what my husband described in his review, that the ottoman that connects to the reclined seat when in flat bed position is at a slight incline, but I too found this to be true. The seat cushions themselves recline to near perfectly flat, but then the ottoman part slopes down slightly. 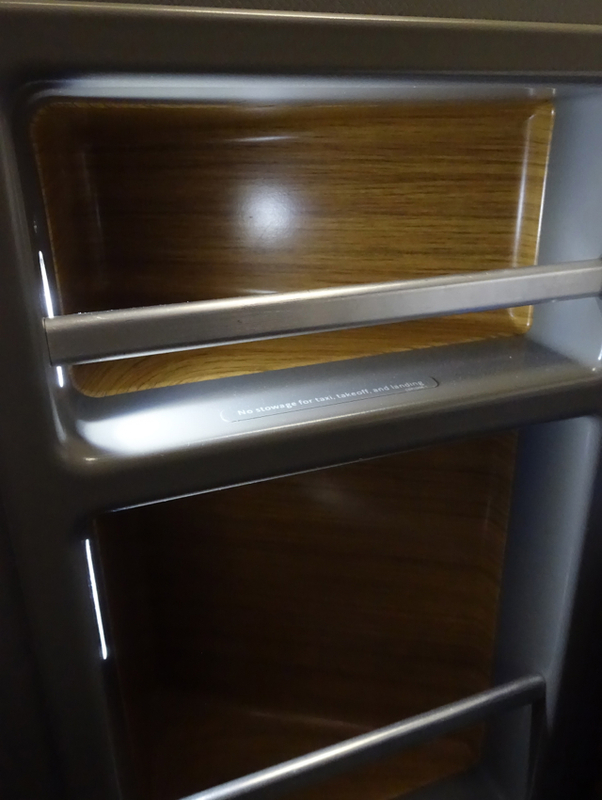 I'm not sure why it was designed this way, but the AA A321 business class bed is actually more fully flat. 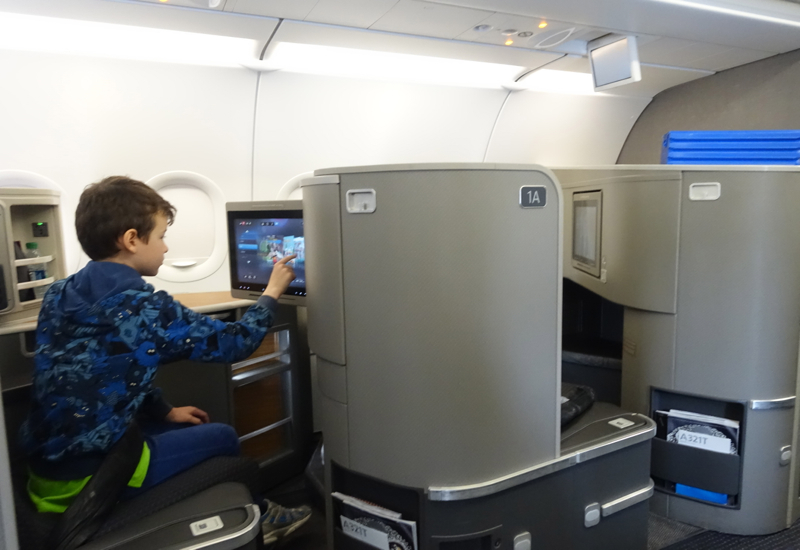 We enjoyed the slightly greater seat space, direct aisle access and privacy of American Airlines A321 transcon first class. But the food was only slightly better and I actually preferred the more fully flat business class bed in AA A321 business Class. I would definitely not pay any significant difference on a paid ticket, and in all likelihood would not pay the incremental difference in miles either to fly AA A321 first class over business class, certainly not if I was traveling with my son or husband. The most compelling case is if you highly value privacy and direct aisle access and are flying solo. 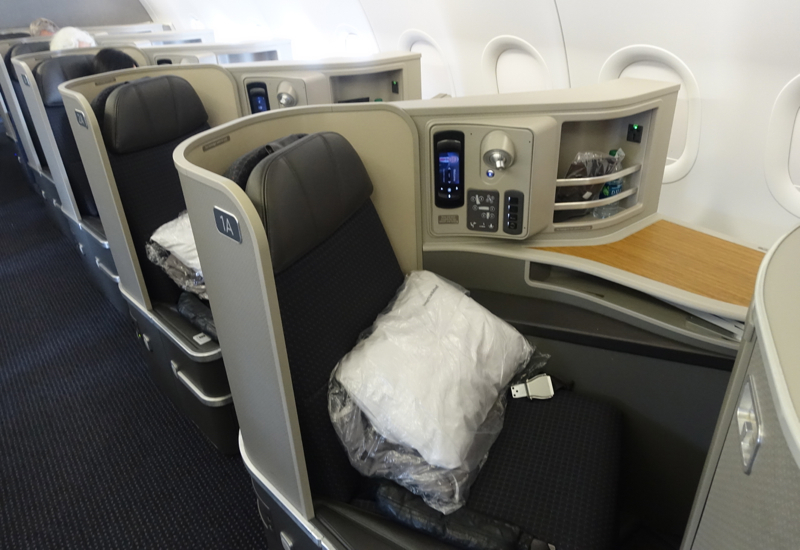 If you've flown American Airlines First Class on the A321 recently, what was your experience? Become a TravelSort Client and Book Your Luxury Hotel with Virtuoso Amenities!